It is well known that unlike Kawwali, Paheli and other artistic innovations, it is irrefutable that Amir Khusro could not have made Tabla, as the instrument developed only after Khyal gained the status of mainstream vocal form. Tabla is indeed an advanced percussion, less because of form and more because of range of stylistics. It employed the complex rhythmic patterns of Pakhawaj with malleable sounds of Patah (or Dholak). Indian percussion instruments allow multiple methods of stroke. While fingers and palm dominate in Pakhawaj, the use of lower palm is prominent in Patah. Through the base of palm, a player can manipulate sound in several ways. It is this addition that accoreded new dimensions to rich rhythmic patterns of Pakhawaj, on Tabla. Ideas may exist unexplored or in isolation for centuries, before gaining their full form. The panel Dancing Ganesha, currently in possesion of Philadelphia Museum of Art, originally hails from a temple in Gwalior. The piece is purported by experts to have been made around c. 750. 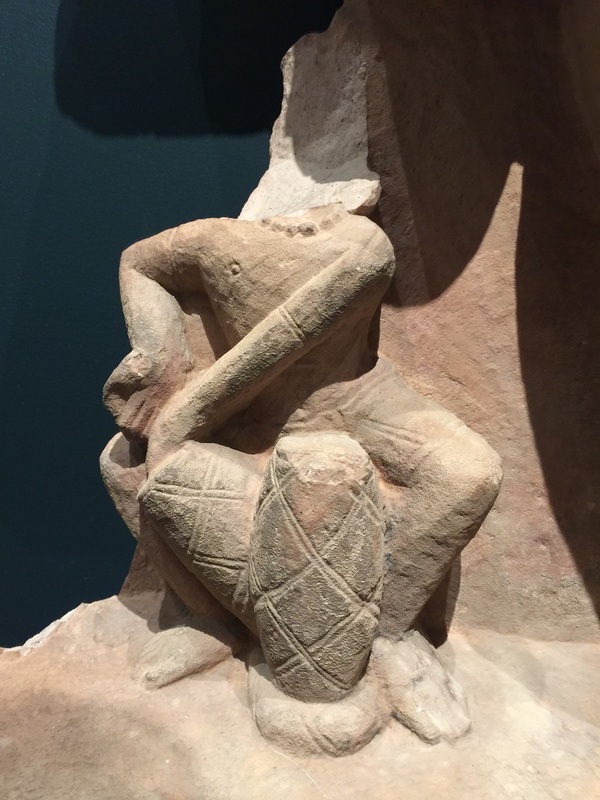 On the right bottom corner of the main figure is a seated player with two Mridang-s, one fully vertical, the other held at an angle and supported by right knee and leg. The sculptor has crafted it as an action piece, where the player is delivering a dramatic Sam (the ending stroke of a rhythmic pattern) with his left arm stretched to strike the inclined Mridang placed right. The right palm is stretched open, ready to follow with base of palm work on the same Mridang. Tripushkar, another ancient form of percussion, too may have contributed to experimentation. The third striking surface was placed perpendicular to two faces of a regular mridang. Change in the angle of stroke is cetain to provide a relief from regular rhythmic pattern being played out on the two opposing sides. Researchers may find more concrete examples to trace linkages especially from this dark period. The two centruries or more between tenth and twelfth yield very few clues while there is a striking change and innovation that is measurable on basis of literary and sculptural evidences between ninth and thirteenth centuries.